There has been dissatisfaction that the SDGs treat teachers as a ‘means of implementation’, which risks underestimating the profession’s fundamental contribution to the provision of good quality education and an enabling learning environment. The formulation of the target is weak, with a limited conception of key teacher issues. The GEM Report addresses the monitoring implications of the more general commitment, expressed in the Education 2030 Framework for Action, to ‘ensure that teachers and educators are empowered, adequately recruited, well-trained, professionally qualified, motivated and supported’. Overcrowded classrooms remain common in many of the poorest countries, pointing to an inadequate supply of teachers. There are two major challenges in defining a teacher shortage: Statistics on average teacher availability hide substantial inequality within countries, and the quantity of teachers cannot be isolated from quality. Policy-makers have often responded to expanding enrolment and increasing class size by lowering hiring standards. Data are scarce on what the target refers to as the supply of ‘qualified’ teachers, which tends to be understood mainly in terms of academic qualifications. In 2014, on average, 82% of teachers had the minimum qualifications required to teach in pre-primary education, 93% in primary education and 88% in secondary education. The global indicator for target 4.c – the percentage of teachers with minimum training – has wider coverage but lacks a benchmark with which to compare national standards. Even so, there is clear evidence that many teachers have not received the minimum training. In the Caribbean, 85% of primary school teachers are trained. In Northern Africa and Western Asia, 73% of pre-primary school teachers are trained. 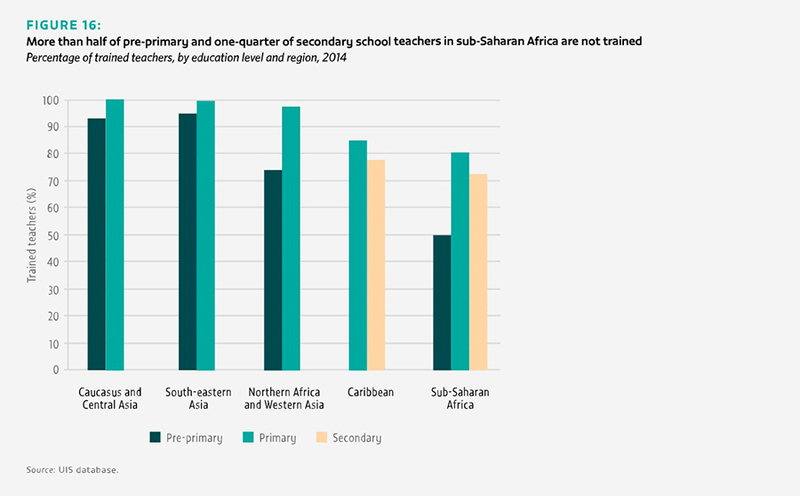 In sub-Saharan Africa, less than half of pre-primary and three quarters of upper secondary school teachers are trained. Aid to teacher training tripled over 2002–2014 to US$251 million, equivalent to 2% of total direct aid to education. Least developed countries received 41% of total aid to teacher training and small island developing states 7%. How to motivate and support teachers is a major policy concern reflected in the Education 2030 Framework for Action. Collecting information directly from teachers on factors such as motivation and job satisfaction entails considerable challenges. The report looked at external factors, primarily related to government policy: induction and mentoring, continuous professional development, working conditions and remuneration. The 2013 Teaching and Learning International Survey found that about 25% of lower secondary school teachers with fewer than five years of experience said they had been assigned a mentor, dropping to 6% in Chile and 9% in Italy. A competitive remuneration package is an essential component of recruiting and retaining the best people to the profession. In the Dominican Republic, the average teacher earned about 70% as much as other professionals, while in Uruguay, teachers enjoyed a slight advantage. Overall, there is a long way to go before reliable data on salaries, working conditions and attrition can be captured.